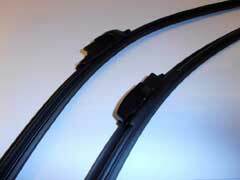 Honda Wiper Blades Replacement - How Often and Which Brand To Choose? Experts say you should change your windshield wiper blades once every 6 to 12 months. Since these are like any parts, they are susceptible to damage from a wide variety of factors including inclement weather (especially ice and snow) and warping. As conditions vary, you’ll want to inspect your Honda wiper blades to make sure they are operating well. When you test them, check to see that they are removing water off the windshield without streaking. Another sign to replace your Honda wiper blades would be if they made a squeaking sound when in use. If you notice either of these happening, then it’s time for new ones. It’s important to change them immediately, as it can help you have better coverage of the road. Most likely, all you will need is wiper blade refills, which are easy to install. Even if you change brands, they come with an adapter making installation quick. When shopping for the best wiper blades here are some tips. You will find all kinds available. When selecting Honda wiper blades keep in mind what season it is, as they do have some designed for specific seasons. Additionally, options that are more durable may last longer. silicone wiper blades have a durable construction that can hold up against a wide variety of conditions, thereby providing you the clear vision you need. Ultimately, you should inspect your Honda wiper blades at least once a month. When you notice signs of wear replace them right away, as this can help to provide better visibility for you on the road. Changing your blades is a quick and inexpensive task, but one that can help keep you and others safe on the road.